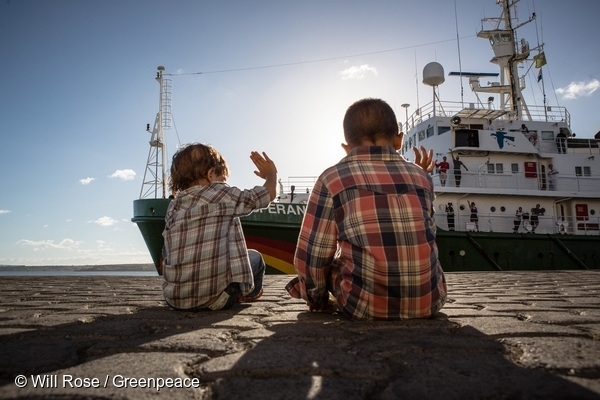 The smell of fish is all around the Greenpeace Esperanza. We’ve been docked in Diego Suarez in Madagascar, getting ready to take on the tuna giant Thai Union again. Fittingly, there’s a fish processing factory right next to the ship. The symbolism gets even better. As we sail out, there’s a rainbow in the sky. Greenpeace has been tackling overfishing for years, and last fall we appealed to Thai Union –the biggest tuna company in the world – to switch to fish caught sustainably and under humane working conditions. Over 300,000 of you joined that call, making sure Thai Union heard it loud and clear. Now the Esperanza is riding that incredible wave of support into the Indian Ocean. Thai Union has tried to fix the dents in its reputation, but the limited steps the company has taken simply aren’t enough. So now we’re back for round two, and we need you on board with us once again. We’ll be sailing the East African part of the Indian Ocean. This is where the enormous French and Spanish fishing vessels try to catch as much fish as they can in the least amount of time. Many of these vessels supply Thai Union – with that tuna ending up on shelves around the world. The unsustainable fishing methods of these vessels puts more and more pressure on tuna stocks. They also catch all kinds of other marine life – including sharks – and throw them back into the ocean, dead or dying. They call it “bycatch.” To make matters worse, they pollute the ocean with ghost nets and a growing number of decoy debris called FADs (fish aggregation devices) meant to lure tuna. This time we’re taking a different approach. After all, bearing witness does not only mean that we document. We’ll be peacefully opposing the destructive practices of these fishing vessels to prevent the indiscriminate harm caused to marine life. We are sailing out to find the fishing boats, expose their fishing methods and clean the Indian Ocean of the FADs we find. You can join us. Tell Thai Union how you feel about the unsustainable tuna they sell us. Sign the petition today. And follow the Greenpeace Esperanza’s journey through the Indian Ocean on Facebook and Twitter. François Chartier is oceans campaign leader for Greenpeace France.